Quick Update on Pufferpunk's Puffer Conveyed this morning: after the H202 dip (with fresh H202) the puffer's eyes are noticeably clearer. 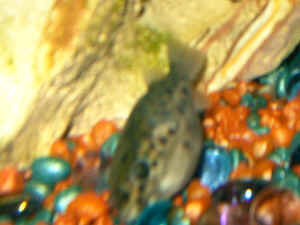 Unwell Leopard Puffer Fish >Hi, >>Hello, Marina here, but am also sending this to the resident brackish expert, Ananda. 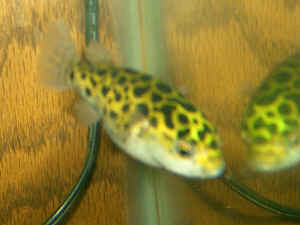 >About three weeks ago, I purchased two Leopard Puffer Fish (about 1" long). They're currently in a 90 Gallon Brackish Water aquarium that I've had for about two years. Partial water changes are made religiously once a week. The one puffer fish is doing fine, looks healthy/eats/moves around a lot. The other puffer started off fine, but after a few days, I noticed his belly had a few thin dark lines. It almost looked as if food had leaked out of his stomach, but not through the surface of his skin. Since then (about three weeks), his belly has gradually gone from white, to a dark black color (from his tail, moving up towards his head). He spends a lot of time laying at the bottom of the tank, still get's excited during feeding time, but seems to have problems eating (choking). As of today, I also noticed ick in the tank (two visible ick cysts on our Australian Finger Fish, and upon closer inspection, both puffers are speckled with ick as well). I returned to the pet store to learn that the puffers we purchased were from a tank that was placed under quarantine shortly afterwards due to ick. >>Great. At least you know, yeah? 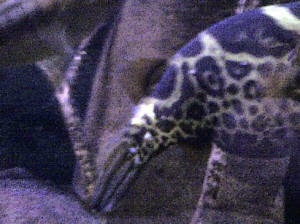 >I'm now treating my tank with ick medication, but my concern is still with the one 'black bellied' puffer. Could this have been caused by the ick? The other puffer does not seem affected in the same way, and aside from the ick, all other fish are doing fine. Should I be considering some sort of internal parasite or infection? I asked some of the employees at the Pet store and got strange looks as a result. Searching the internet has not provided me with much information on any Puffer Fish related illnesses. Any suggestions would be greatly appreciated. >>I'm giving you this link on f/w puffer FAQ's.. http://www.wetwebmedia.com/BrackishSubWebIndex/fwbracpuffaqs.htm http://www.wetwebmedia.com/FWSubWebIndex/fwpufffaqs2.htm http://www.wetwebmedia.com/BrackishSubWebIndex/bracpuffaq2.htm Please follow the links within links, sorry I can't be of better help at this time. Puffer Problems Hi Bob, As always, thanks for the great site. Here's a good one for ya... I see Puffers develop a graying area in the skin, which eventually spreads. We call it "Puffer Cancer", for lack of better terms. Once it starts, there is no repair, and the fish eventually dies. Any idea what we are dealing with here? <I have seen it in other stores and always thought it was because of use of meds.> We love our Puffs, and any input you have would be most appreciated! I only see this malady in Tetraodons, not Tobies. Is it a reaction to copper? <Could be or a reaction to formalin, malachite green, Methylene blue, either in your store tanks or your wholesalers. -Steven Pro> I await your response. Puffer Puffed! 4/18/04 <Hi, Pufferpunk here> I think your site is great <Thanks!> and I hope you guys can help me cos I'm pretty upset about this new dwarf puffer that I have. I've been keeping one (A) for some time and he's pretty healthy and active. Bought the new one (B) today and the owner at the shop must have been drunk cos he lifted the poor guy out of the water and onto his palm and told me to look at how fat he was! <That's horrible! I woulda kicked that guy right in the gonads! Idiot! You never let a puffer puff with air!> I just read on your site that its terrible to make puffers blow up like this!! When I got back, I noticed how fat he still was. (I don't know if its cos of the incident), and introduced him into the tank with A. He didn't moved much and stayed mainly at the bottom on a rock so I thought he was just trying to adjust. A couple of hours later I saw A nipping B on his pectoral fin and B was helpless and he didn't move much. I was horrified and scooped him up and into a hospital tank with salt and medicine for wounded fins. He's now lying on his side at the bottom of the tank.. I'm afraid to move him.. and I don't know if he's passed.. I did see his tail flinch when I transferred him... Please help!!!! <I'm sure puffer A recognized B's weakened state as an opportunity to pick on him. Quarantine is a good idea, but not with salt. Dwarves are strictly FW & don't like salt. Puffers are very sensitive to most medicines too. Melafix would be ok to use. Is he still puffed? If he is floating upside-down, then you'll have to burp him by holding him underwater vertically, by his tail & gently shaking him until he burps. He may puff again, but that's with water & will replace the air & be easily expelled. If he doesn't recover, I'd say it was from the shock of mishandling of the poor fish. I suggest you copy this email & bring it in to the owner of the LFS & give him a piece of your mind. That employee doesn't deserve to work around live things. ~PP>. Re: this is time again. I have a couple pictures of my puffer I hope these pictures will help you with a diagnosis. the first is what he looks like now and the rest are pictures from before he started acting weird. hopefully they will help you to help me. again, I am REALLY worried about him. he has been sitting in the same spot for the past couple of hours and just recently he got spooked by another fish and puffed up. I was worried because he has never done that before and he was swimming funny afterwards.